The USS Voyager NCC-74656 was launched in 2371 on stardate 48038.5 from Earth Station McKinley. Prior to its mission to search for a missing Maquis raider, Voyager was in drydock at Utopia Planitia for final systems installation, from here Captain Kathryn Janeway took command. 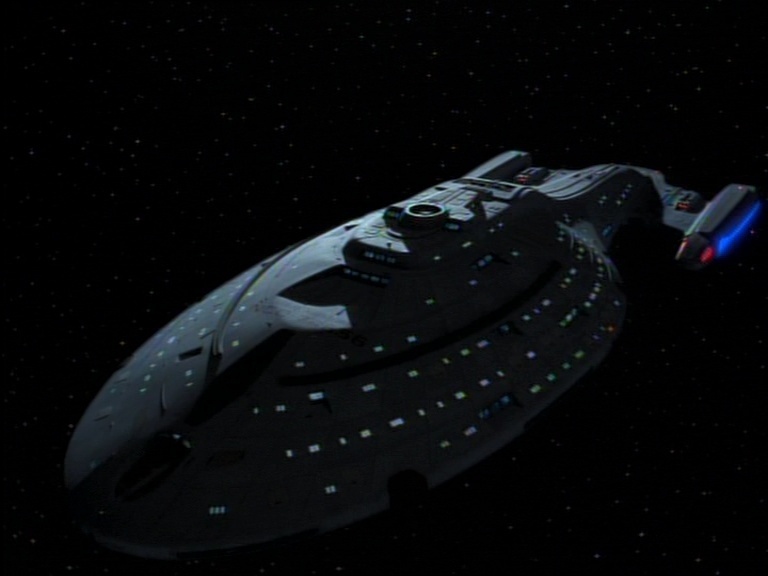 Voyager had a crew of a 141 officers for her original three-week mission to search for a Maquis ship lost in an area near the Bajor system known as the Badlands. On that search mission however Voyager was also lost, according to initial Starfleet reports. Unknown to Starfleet, she was propelled 75,000 light years to the Delta Quadrant by a powerful displacement wave on stardate 48307.5. In order to protect the Ocampa, Janeway broke the Prime Directive and destroyed the Caretaker Array, their only means home. From that point the crew of the Maquis ship joined Voyager after their ship was destroyed. After Voyager was stranded in the Delta Quadrant, the crew made several modifications. The captain's dining room was converted into a galley for Neelix to cook unreplicated food, and the crew established a hydroponics bay to grow their own food. The crew also made significant changes to the ship's sensors, massively upgrading the Stellar Cartography system turning it into the Astrometrics Lab which was used to chart a new course home that took off five years of travel. In 2374, Voyager found a Hirogen communication network which picked up a signal of a Starfleet vessel in the Alpha Quadrant. Unable to carry a direct message across net, Voyager's Emergency Medial Hologram was sent halfway across the galaxy to the Starfleet vessel USS Prometheus NX-74913. The EMH notified Starfleet Command of Voyager's situation and the families of the crew were also able to send letters across the Hirogen relay net to Voyager. The net was destroyed and no further contact was made. At the end of 2374 Voyager discovered what appeared to be a Federation starship, the USS Dauntless NX-01A, sent to bring the crew home. 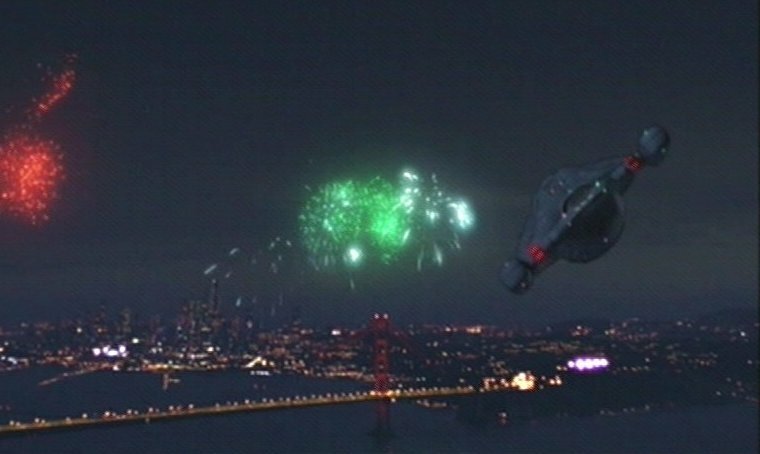 The Dauntless was an alien fake, however, Voyager was able to use it's Quantum Slipstream Drive to get closer to home. In late 2375 Voyager encountered another Starfleet vessel the USS Equinox NCC-72381, this ship was also transported to the Delta Quadrant by the Caretaker. Using an alien race as fuel the Equinox left Voyager to be attacked by the entities while the Equinox had Voyager's EMH and Seven of Nine onboard. Voyager later caught up with the Equinox and recovered the Doctor and Seven. After being attacked by the alien lifeforms the Equinox suffered a warpcore breach destroying the ship and killing Captain Ransom. Survivors of the Equinox joined the Voyager crew. In early 2376 while working on the Pathfinder Project, engineer Lieutenant Reginald Barclay was able to establish a brief two-way communication with Voyager from Earth using the MIDAS array directed at a Class B itinerant pulsar to create an artificial singularity. Starfleet discovered it could send transmissions from the MIDAS array to Voyager on a 32 day cycle, with Voyager able to respond within 17 hours after receiving the transmission. Near the end 2377 Harry Kim and Seven of Nine discovered that Voyager could communicate with Starfleet in real-time by bouncing a tachyon beam off a quantum singularity for approximately 11 minutes a day. As a result the crew received its first official Starfleet mission in over seven years to retrieve the Friendship One probe. However lost one of their crew, Lieutenant Joe Carey, during the mission. Voyager has used other methods to shorten its journey home which has included quantum-slip stream technology, taking 10 years off, a transwarp coil from a Borg Sphere which took off 20 years of travel, and a subspace catapult which sent Voyager across 30 sectors of space, about 600 light years. In 2377, Admiral Janeway from the year 2404 traveled back in time in an attempt to get Voyager home sooner. 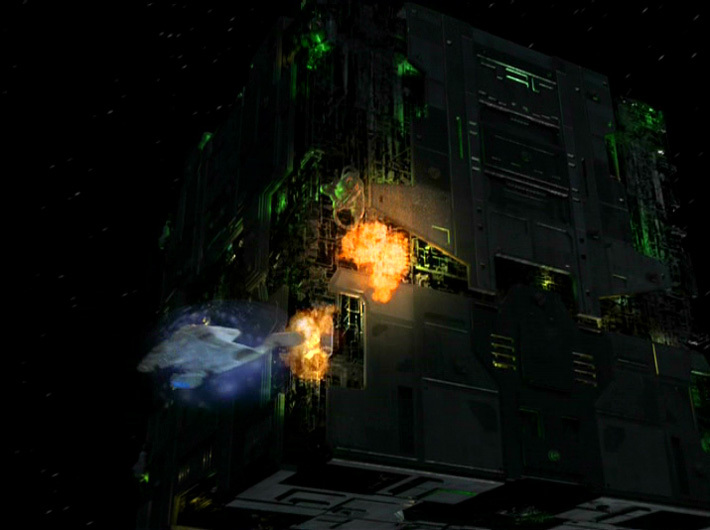 Using advanced weaponary from the future Voyager was able to use a Borg transwarp hub destroying it behind them. Admiral Janeway sacrificed herself to deliver a major blow against the Borg and allow Voyager a chance to get home. Voyager arrived at Earth greeted by a fleet of 27 Starfleet vessels expecting a Borg invasion. The 5-foot long model of Voyager used for effects shots was built by a team of model makers led by Tony Meininger. An unusual feature of the model is the use in the windows of small slide photos of the actual sets, giving the viewers the sense that they are actually looking in the ship as it passes by. Voyager was created by Emmy-winning production designer Richard James, who designed the interior sets, and illustrator/technical consultant Rick Sternbach, who designed the ship's exterior.